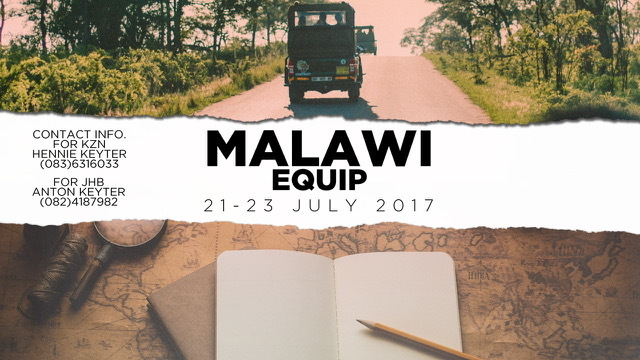 We have just returned from a trip to Malawi in preparation for the 2017 Malawi Equip. This year we are expecting about 3000 church leaders to attend, from all over Malawi and Mozambique. All the local pastors will be covering their own accommodation and transport costs to and from Blantyre. We will be contributing towards feeding them while at the Equip meetings. So if you or your partnering church would like to help towards these expenses please contact Anton Keyter on 082 418 7982 or Rita Keyter on 083 785 2924 for further details. If you have any folk in your church that would like to be part of, and serve at the Equip, please extend the invitation to them. There are two options to get to the Equip in Blantyre, either drive up or fly up. For the drive up team, we will be departing from two locations. The first will travel from KZN with Hennie Keyter, leaving in the evening on the 11th of July. The second will travel from Jhb with Andrew Crawford and Dave Whalley leaving in the morning of the 12th July. Both teams will meet up in Maputo on the 12th and travel the rest of the trip in one convoy to Blantyre. The drive back will start on Sunday 23rd returning to SA on the 25th July. For those who would like to be part of the fly up team, we recommend two arrival dates in Blantyre. You will need to organise your own flights, arriving on Sunday 15th July or on Wednesday 19th July. If we know you are coming we will organise someone to pick you up at the airport on these days. Your departure for your return flight needs to be for Monday 24th. Please note that the purpose of your involvement will be to serve. With 3000 people attending we need as many hands to help as possible. Accommodation in Blantyre will be camping, so anyone coming along will need to bring their own tent and camping equipment. Download the slide which you can use for advertising to your church on your multimedia platforms. If you have anyone interested in joining the team. Please contact Anton Keyter on 082 418 7982 or Andrew Crawford on 072 122 8052 in Gauteng or Rita Keyter on 083 785 2924 for KZN, and we will forward you further details. Lastly, we are needing to plan the logistics so please can those interested reply by Friday 2nd June. All finances and payments will need to be in by Friday 30th June. We trust you will join us on this adventure in advancing the Kingdom.